In cooperation with Prokop Bartoníček. 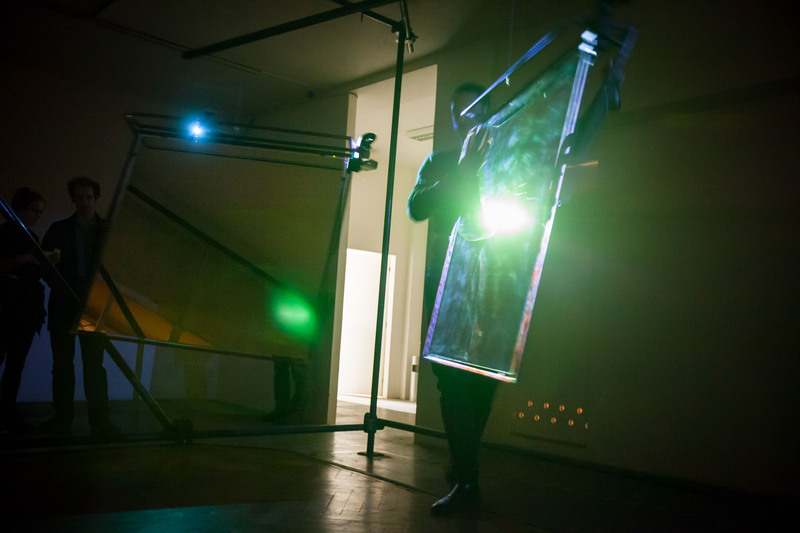 Prism is an interactive and tangible mixed-media art installation. It consists of two large mirrors which are suspended like a mobile from a metal scaffolding. They can travel freely around the room and are set into motion by visitors. 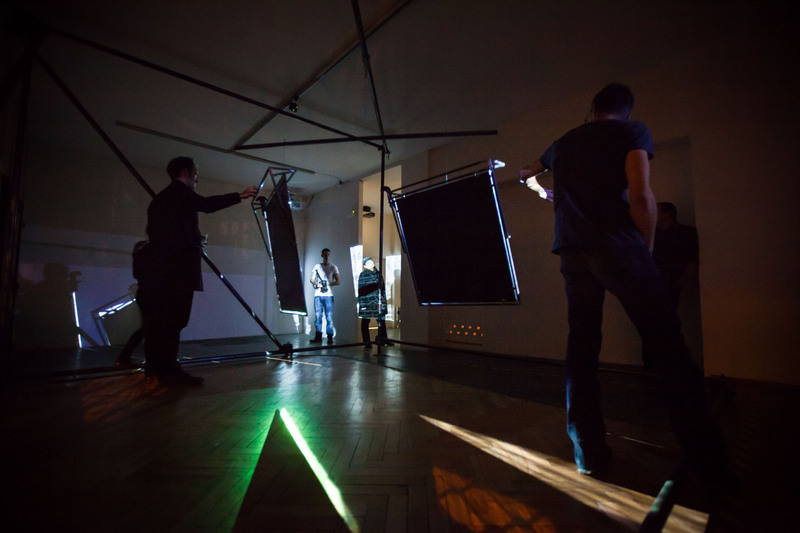 From projectors, image fragments are projected onto the moving mirror surfaces. As a result of the reflections, a prismatic, complex and ever changing visual composition is being reflected onto the walls that surround the installation. The intertwining of projection, generative imagery, interactive participation of the visitors, and reflection onto the walls of the actual exhibition room creates an experience in which a visitor can’t possibly establish a singular, coherent point of view or perspective onto things. Images blend into each other, shadows of visitors become part of the reflections, associations surface as fast as they are being overlaid by new ones. Today, our attention is constantly attending to multiple layers and spaces simultaneously, many of them digital, virtual, and ubiquitous. Each of them has a different set of vanishing points. As Gianni Vattimo puts it, "the increase in possible information on the myriad forms of reality makes it increasingly difficult to conceive of a single reality. [...] For us, reality is rather the result of the intersection and 'contamination' (in the Latin sense) of a multiplicity of images, interpretations and reconstructions circulated by the media in competition with one another and without any 'central' coordination." (Vattimo, The transparent society, 1992). 25 years after Vattimo's observation, this is anything but less the case. We are much more intensely exposed to uncorrelated and competing clusters of information and media fragments. To form one's own opinion, one's own perspective on things, is becoming more difficult. A person’s point-of-view as one single, coherent thing, has rather turned into a shifting, refracted phenomenon: a 'cloud' instead of a point; a ‘kaleidoscopic view’ rather than a central perspective. This is valid for the visual or optical understanding of point-of-view, as well as for the understanding of the term as a person’s opinion on a discourse. In the era of post-truth, traditional (media) reference points like public TV or long-established newspapers are not accepted any more by whole communities, while fake identities and fake news can have considerable effects in social media. 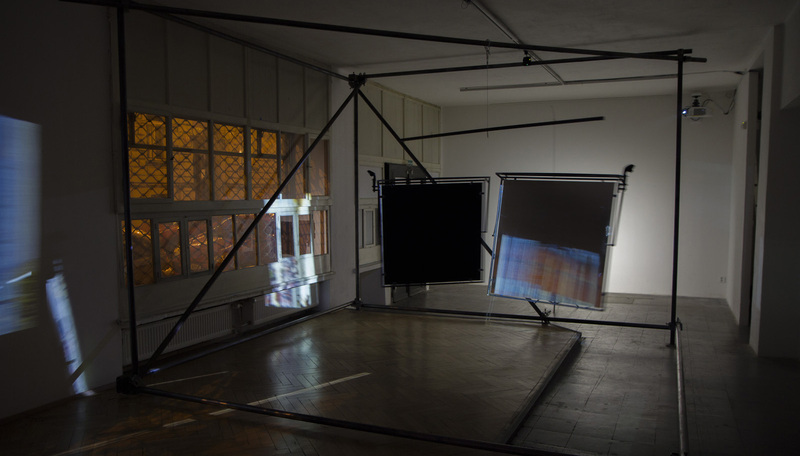 It is these contrasts of haptic and digital, of fleeting and emerging, of central and prismatic perspective, and their mutual influence upon each other, that the installation operates on.